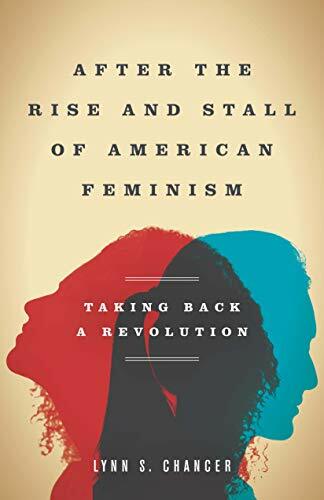 Lynn S. Chancer has undertaken a difficult challenge in her latest study, After the Rise and Stall of American Feminism: Taking Back a Revolution. She attempts to ground a carefully researched analysis of the evolution of “feminism” over the last half-century within terms of her personal experiences as an activist, scholar, and wife/mother. It’s an effort one can learn much from. Chancer is a sociology professor at the City University of New York (CUNY) and author a number of works on feminism. She is well-versed in feminist literature and related academic and other scholarly materials. She has written a well-intentioned and well-argued book, but does it answer the fundamental challenge she poses: Is it possible to “take back a revolution”? After the Rise and Stall of American Feminism examine four key issues that Chancer argues are shaping 21st century feminism: (1) ongoing structural or systemic inequality, (2) nontraditional sexual identity, (3) violence against women, and (4) media representation of sexuality. Each is carefully considered. Ironically, Chancer’s study comes out at a propitious moment, just a month after 100 women took seats in the U.S. Congress, fundamentally changing the historically composition of a two centuries-old male bastion. Equally significant, it comes out after the nation’s first (but second time) female Speaker of the House, Rep. Nancy Pelosi (D-CA), along with the House Democrats, defeated Pres. Donald Trump’s shut-down of sections of the federal government. Pelosi not only stood-up to the president principle campaign promise, to build “The Wall,” but—politically speaking—emasculated him. Are these developments a result of a “feminist movement” or a “women’s movement”? These are different movements that, sadly, Chancer doesn’t seem to acknowledge. Example of this oversight are found in her discussion of both the “first” and “second” feminist movements. Chancer, like most second-wave feminist, looks back fondly to the early women’s movement led by Susan B. Anthony and Elizabeth Cady Stanton, among others. She repeatedly stresses their strong support for the abolition of slavery. However, she does not acknowledge their support for temperance and that they founded, in 1852, the New York State Temperance Society. This is critical because, a half-century later, an alliance of suffragettes and prohibitions secured the passage of the Eighteenth (prohibition, 1919) and Nineteenth (women’s vote, 1920) Amendments. These successes reflect what can best be identified as the broad “women’s movements” that arose out the nation’s modernization, a process that transformed the domains of both public (politics) and private (household) life. However, a half-century later, a “feminist movement” arose that raised a fundamentally more profound and intractable concern, patriarchy. It grounded its critique of power, whether political, social and interpersonal, in terms of gender relations. While Chancer offers a general critique of Phyllis Schlafly and her STOP-ERA campaign, she fails to consider why (or how) the Equal Rights Amendment was defeated. More troubling, she doesn’t acknowledge the deep splits among the 20,000 (mostly women) who gathered in Houston, TX, on November 18, 1977, for the National Women’s Conference. These splits bespoke the differences between the (moderate) women’s and the (radical) feminist’s movements. Among those who attended the Houston convention were First Ladies Lady Bird Johnson, Rosalynn Carter, and Betty Ford along with 2,000 delegates drawn from all 50 states and consisted of one-third nonwhites, one-fifth low-income people, and representatives of all major faiths. Participants included Reps. Bella Abzug (D-NY), the event’s presiding officer, Shirley Chisholm (D-NY) and Barbara Jordan (D-TX) as well as Coretta Scott King, Maxine Waters (future Congresswoman, D-CA) and Ann Richards (future Texas governor), Sarah Weddington (who represented "Jane Roe" in the landmark Roe v. Wade case) as well as leading second-wave feminists Betty Friedan and Gloria Steinem. They all came to promote the ERA, but some endorsed abortion rights, gay rights and a host of other issues. One sign that captured attention proclaimed, "Mother Nature is a Lesbian." Schlafly was for all purposes a “feminist,” a rightwing or conservative feminist. Like many of the leaders of the pro-ERA forces, she was a woman of privilege. She was a lawyer, a writer, an accomplished public personality as well as a wife to a successful lawyer and mother of six; often forgotten, one of her sons was gay and she said she loved him. Most remarkable, she built a nationwide, grassroots movement of mostly local church-going women, including many “stay-at-home” housewives, that successfully reversed the pro-ERA tide. As Chancer acknowledges, in their fight against the ERA, Schlafly and her female co-conspirators effectively exploited radical statements made by some within the pro-ERA forces. Schlafly’s supporter effectively exploited claims that the ERA would lead to the drafting of women into the U.S. military (and serve in Vietnam War combat), gender-neutral military barracks, bathrooms and jails, loss of alimony and child support, abortion and lesbian rights, among other issues. In addition, public discussions of women’s issues were often mired in sophisticated—if not academic—analysis that non-middle-class, non-college-educated women did not appreciate. Many felt that pro-ERA literature was too encumbered by exhaustively detailed arguments, bibliographic references, and turgid quotations. The defeat of the ERA, of the moderate women’s campaign, helped propel forward the more radical second-wave feminists. The fragmentation of the feminist movement is a sign that the movement may have been institutionalized like the older trade union, civil rights, and environmental movements that preceded—and parallel—it. Chancer’s consideration of “intersectionality”—the integration of gender with class, race, and sexuality into a coherent approach—acknowledges the shift in the political paradigm that seems underway. This development may foster a new political culture and theoretical analysis appropriate for the 21st century. One of the most revealing aspect of Chancer book is how she incorporates her feelings and experiences into the theoretical narrative. At one point, recalling the more militant days of the early second-wave feminist movement, she was challenged by a friend for being “overly desirous of male company.” She wondered that “my life was a living contradiction . . . was I full of bravado in some ways and utterly traditional, even submissive, in others?” It’s the kind of question many ask of themselves and a good reason to read Chancer’s After the Rise and Stall of American Feminism.